C-HOPE (Citizens for Historical Opportunity, Preservation and Education in Randolph County) has been instrumental in saving First Ward School, an endangered Elkins landmark. • In partnership with Elkins Historic Landmarks Commission, had an existing conditions report prepared by Van Nostrand Architects demonstrating that the building was salvageable. • Developed a reuse plan showing the potential and a variety of options for the for the building, looking for solutions that would make it over into a self-sustaining asset to our community. AFHA AmeriCorps members helped develop and distribute this plan. • Received a Development Grant from the WV SHPO Division of Culture and History for repair of the slate roof. 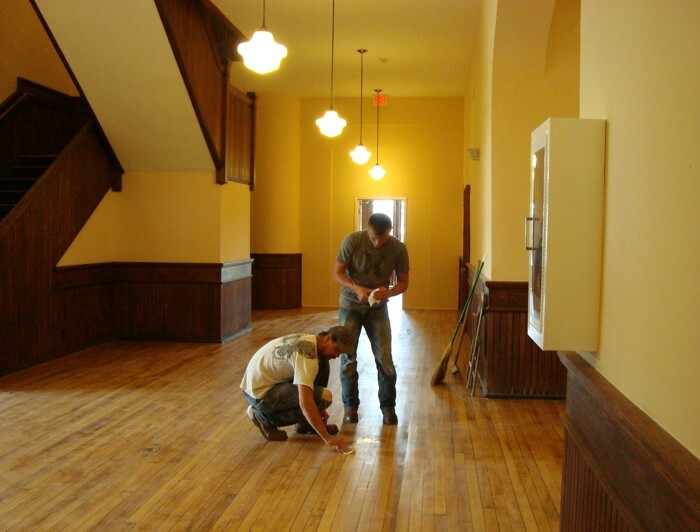 • With help from PAWV and the Randolph County Housing Authority, connected with AU Associates, who developed a partnership to use historic preservation tax credits and low-income housing tax credits to redevelop the building into low-income senior apartments. They completed a high-quality rehabilitation that retained and restored many of the features of the historic building, including replacing the front portico, while building in state-of-the-art quality apartments. Interested in renting an apartment in First Ward School Apartments? First Ward School is one of the last of its kind. A model for all West Virginia schools in the early 20th Century, it was a building of local significance for the history of Elkins. The school, located on South Davis Avenue, was built in 1909. It is designed in the Georgian- Revival style by Fairmont architect Andrew C. Lyons and was constructed of locally available building materials such as hand-cut sandstone, brick, and native hardwoods. The eight room schoolhouse design was very modern for its day. It featured a modified “H” floor plan, rows of large double-hung windows, large open rooms with cloakrooms, twin sets of staircases, wide halls, indoor plumbing, washrooms, kitchen, electric lights, and central heat. 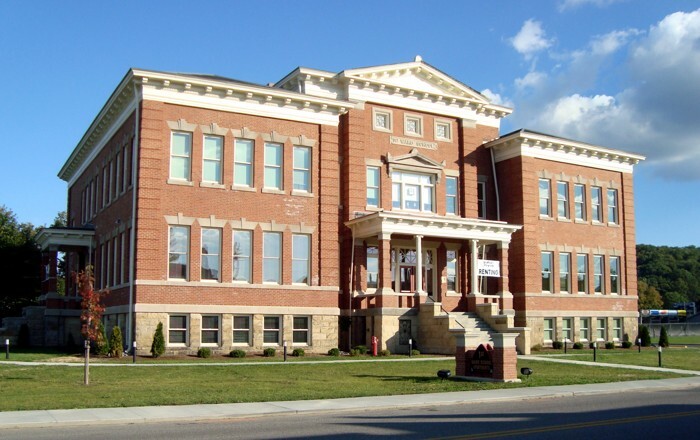 In 1910, the school’s architecture was highlighted in a publication by what was then called the “West Virginia Department of Free Schools.” First Ward’s design was described as one that should be emulated in cities across the state. First Ward served as a school until 1976, when it was converted into a warehouse for the school district. Fortunately, changes then were minor, but little maintenance has been done since. The only major alteration to the exterior came in the 1980’s, when the original front portico was replaced with an overhead garage-type door to facilitate the loading of quantities of books into the building. 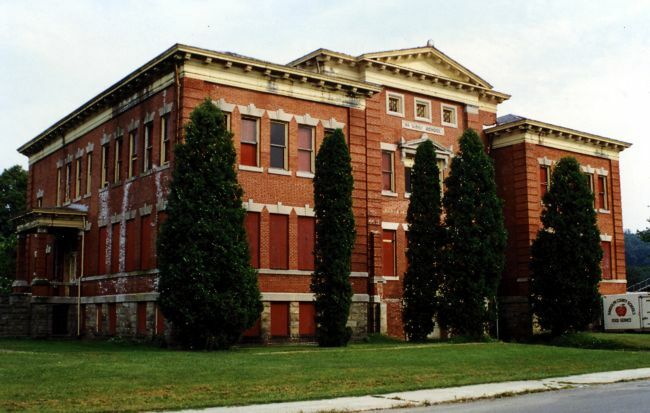 First Ward School was selected by Preservation Alliance of West Virginia for the 2009 Endangered List. This designation helped to highlight the need to save the building, raised public awareness, and provided technical assistance to help with planning and preservation. First Ward School building was closed as a school in the 1970s and was used as a storage facility for a number of years thereafter. It was later essentially abandoned, with an increasingly serious roof leak. It sits next to the old Elkins High School, which is not as old but is in much worse condition, and is slated for demolition as soon as funding can be found. 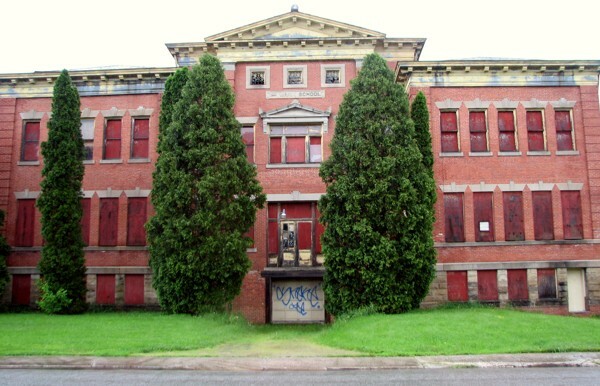 C-HOPE and Elkins Historic Landmarks Commission funded an initial study of the building, working to persuade the school board that the building should be saved and adaptively reused, instead of being torn down with the High School. C-HOPE is seeking support letters for grant funding to repair the roof. Anyone interested in helping on behalf of the building, please contact C-HOPE for more information.